Guysss, forced rhubarb season is upon us! I don’t know about you but I always find Winter seasonal fruit and veg can be a little uninspiring at times, so forced rhubarb is giving me LIFE right now. I feel like it’s a sign that warmer weather is coming (even if it might be a good few months away) and with it comes new seasonal produce. Exciting times. Rhubarb is a favourite of mine. I’m a big fan of tart flavours and rhubarb doesn’t half deliver on that. Mix it with some sweetness and it is the perfect accompaniment to a bowl of porridge or a breakfast parfait. That tartness also goes perfectly with fatty meats like duck, pork and goose. And of course, it is a fab filling for pies and crumbles. All in all, it is such a versatile vegetable (yes, I said vegetable) that’s worth getting a hold of at this time of year. 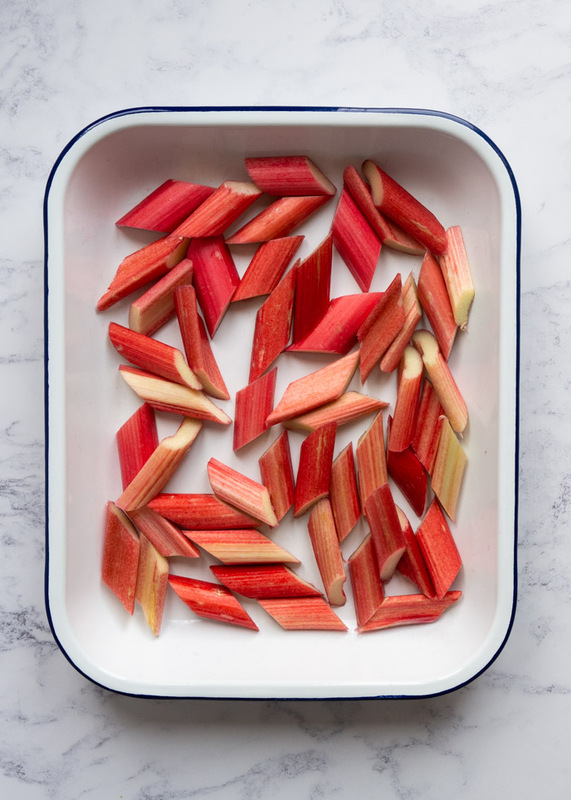 Chop the rhubarb in to 1 inch pieces and pop in a roasting tray. 2. 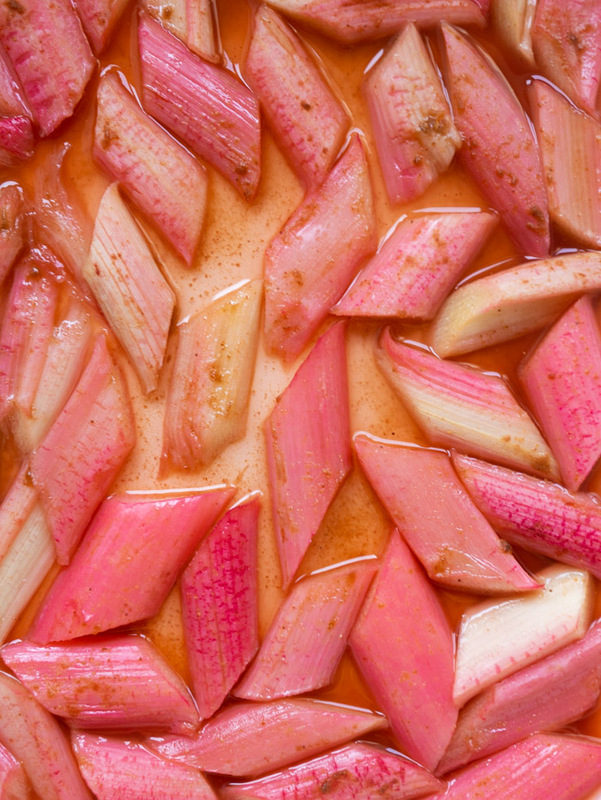 Drizzle the rhubarb with honey and sprinkle on powdered ginger. 3. Cover the rhubarb with tin foil and pop into the oven for 20 minutes at 180 degrees centigrade. 4. Uncover the rhubarb, spoon some of the syrupy juices over the rhubarb pieces and cook for a further 5 minutes. 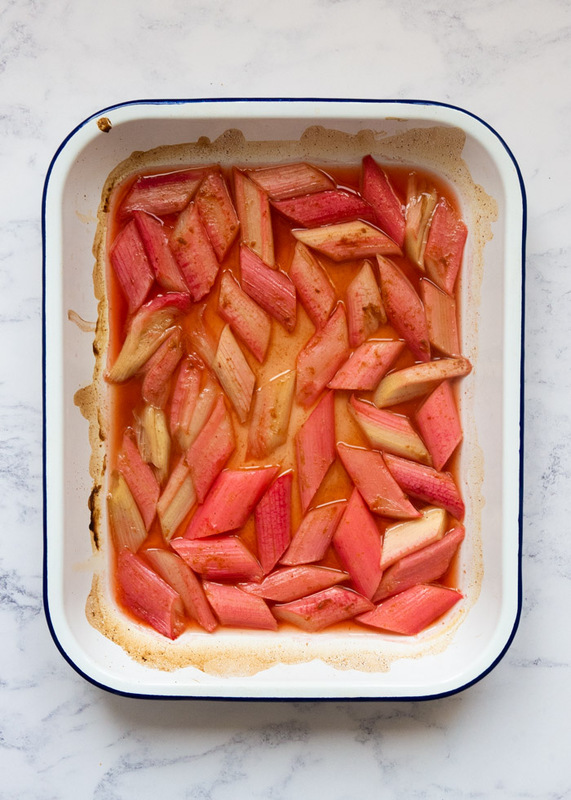 What can I do with my roasted rhubarb? ✨ Use it as a filling for pies and crumbles. ✨ Rhubarb is a great accompaniment to meat such as duck, goose and pork or to fish like mackerel. Serve it the same way you would serve roast pork and apple sauce. ✨ Add it to your morning porridge or to something like thisbreakfast parfait. Store the rhubarb in an air-tight Tupperware container and keep in the fridge for 3-4 days. Can you freeze cooked rhubarb? Yes! This is a great recipe to make in big batches, then freeze additional portions for as and when you need them. Let the rhubarb fully cool after cooking by leaving it at room temperature for up to two hours. Then add the rhubarb to a air-tight container or freezer bag and transfer it to the freezer where it can stay for up to 3 months. Transfer the rhubarb in its container to the fridge to defrost. This can take up to 24 hours so plan ahead. Alternatively, use the defrost setting on your microwave to thaw the roasted rhubarb. Can roasted rhubarb be eaten cold? In the microwave: transfer the rhubarb to a microwave safe container and cook for 2-3 minutes in the microwave. Ensure the food is piping hot before serving. What is forced rhubarb and how does it differ to field-grown rhubarb? Field-grown rhubarb, as suggested by its name, is grown outdoors in fields, and is harvested from April to September. This results in rhubarb that is slightly greener, tarter and more fibrous than its forced counterpart – ideal for stewing and popping into pies and crumbles. In comparison, forced rhubarb is grown in warm sheds with no natural light. In its quest for natural light, it grows quickly, sometimes in a matter of weeks, producing rhubarb that is more of a reddish-pink colour, with small, pale green leaves. This type of rhubarb is sweeter and more tender than the field-grown variety, making it perfect for more delicate dishes. Rhubarb is a vegetable! Except in the US, where, since 1947, it has been declared a fruit. This was to save business’ money on taxes when importing the fruit/vegetable. The ‘Yorkshire Triangle’ – a place between Wakefield, Rothwell and Morley in the North of England, is prestigious for growing forced rhubarb. So much so, that in 2010 it was awarded Protected Designation of Origin status by the European Commission. Other foods with this status include the Cornish Pasty, Serrano Ham and Champagne. To minimise exposure to light, forced rhubarb is often harvested by candlelight. Due to forced rhubarb growing so quickly, you can hear creaking and squeaking sounds within the forcing sheds – this is the sound of the rhubarb growing! Rhubarb leaves contain oxalic acid, making them toxic to eat. 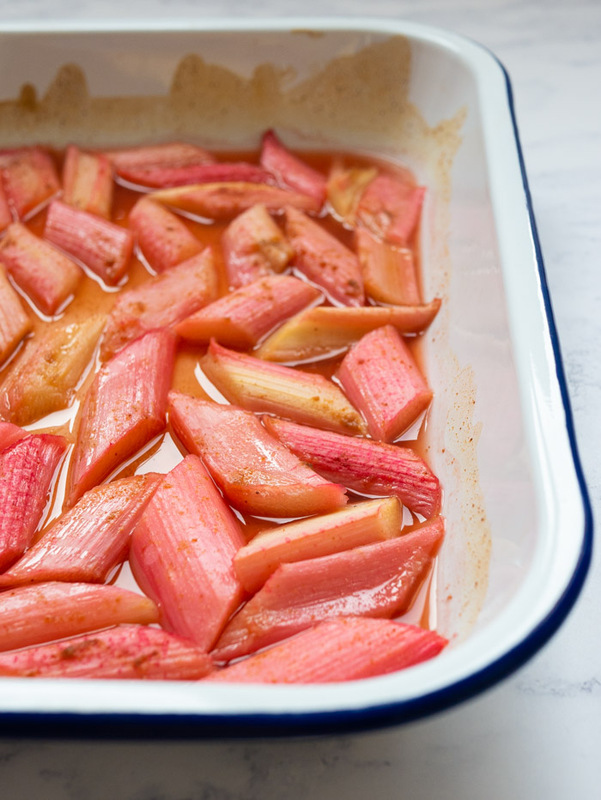 This Roasted Rhubarb recipe with honey and ginger is the best way to use rhubarb. It’s sweet, tangy and so simple to make! You could use it with both sweet and savoury dishes, making this rhubarb recipe also incredibly versatile! Pre-heat your oven to 190 degrees centigrade. Slice you rhubarb into 1-inch pieces, discarding the ends and any leaves. 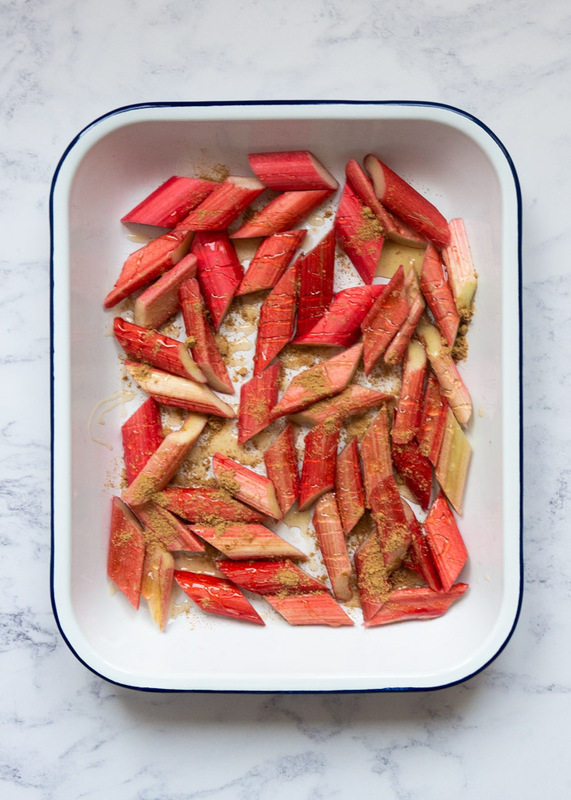 Add the rhubarb to a roasting pan along with the honey and powdered ginger. Toss everything together. 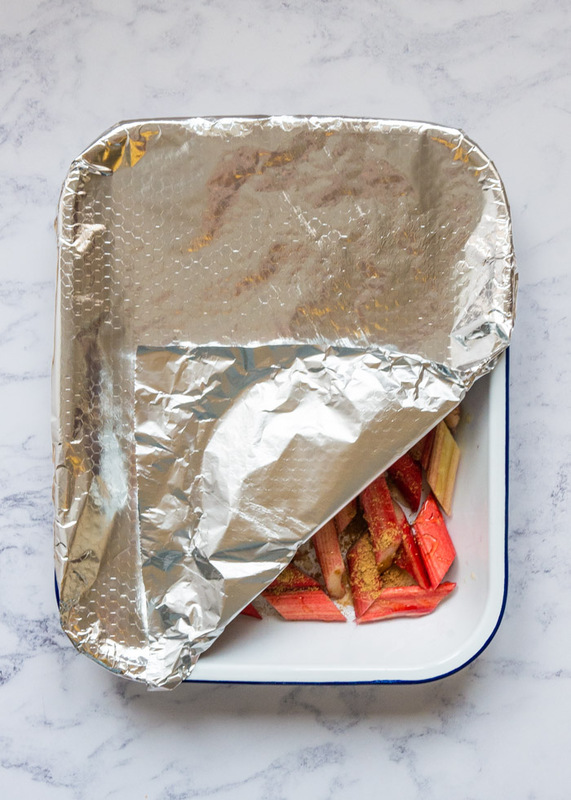 Cover the rhubarb with tin foil and cook in the oven for 20 minutes. After 20 minutes remove the tin foil and discard. Return the rhubarb to the oven for a further 5 minutes. Remove the rhubarb from the oven and leave to cool before serving. Enjoy! Forced rhubarb works best for this recipe but you can also use field-grown if that is what you have. I haven’t had the pleasure of having rhubarb in years, one of my favorites is Strawberry Rhubarb pie, and I am dying to try some of you remarkable suggestions. 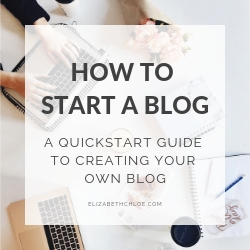 Also, just wanted to say, Right on when giving the tips on this blog post as well. Saving for another day. Strawberry and Rhubarb pie is the bomb!! And thank you, I’m glad you find the tips useful! 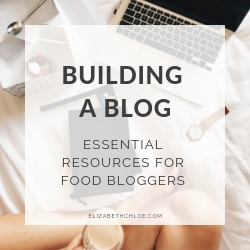 easy, beautiful and freezer-friendly, this is really checking all the boxes! I love rhubarb, I have always done desserts with it, but I’m going to try your idea of using it with duck. That sounds amazing. 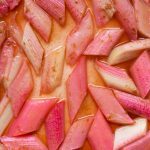 I’m always intimidated by rhubarb but want to give this recipe a try- it looks amazing! Thanks, Emily, let me know how it goes!